FLOWER MOUND, Texas, March 23, 2017 — (PRNewswire) — On the heels of its acquisition of "My Hero Academia" Season 2 earlier this month, Funimation® Entertainment announced today that English-subtitled simulcast episodes of the new season will stream on both Crunchyroll and Hulu, which will launch on April 1 along with the English SimulDub™ on FunimationNow as part of the simultaneous premiere with Japan. As part of this announcement, Funimation will now exclusively stream English SimulDub episodes of "My Hero Academia" Season 2 on FunimationNow while English-subtitled simulcast episodes of the new season will exclusively stream on Hulu and Crunchyroll. As previously revealed, the first six episodes of both the English-subtitled simulcast and English SimulDub will launch on the same day they are broadcast in Japan. "We're pleased to partner with both Hulu and Crunchyroll to bring 'My Hero Academia' Season 2 to both their streaming services," said Gen Fukunaga, CEO and founder of Funimation. "We look forward to launching the new season with them alongside FunimationNow during the simultaneous premiere with Japan on April 1." "We're excited to make 'My Hero Academia' Season 2 accessible to more and more anime fans through this partnership with Crunchyroll and Hulu," said Mike DuBoise, EVP and COO of Funimation. "Fans can look forward to another great season of 'My Hero Academia' beginning April 1." In a world where eighty percent of the population has some kind of super-powered "quirk," Izuku was unlucky enough to be born completely normal. But that won't stop him from enrolling in a prestigious hero academy. Now, the promising freshman class is making its debut at the world-renowned U.A. Sports Festival! It's Quirk versus Quirk as our young heroes face off in the ultimate showdown. Funimation will release "My Hero Academia" Season 1 on Blu-ray, DVD and Digital HD on April 18, 2017. 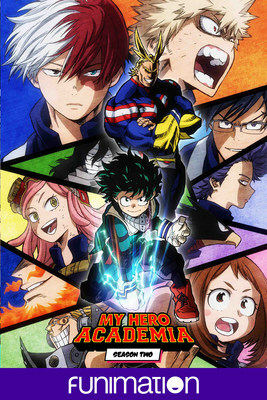 For more about "My Hero Academia" Season 2, including character information and how to "join the Academy" for exclusive news and information, visit funimation.com/myheroclass. To watch "My Hero Academia" now on Funimation, go to funimation.com/myheroacademia. Viewers can catch up on all past episodes of "My Hero Academia" on Hulu now at hulu.com/my-hero-academia.